Are you in a rush when you are on the computer and trying to get everything done as quickly and effectively as possible? There are many shortcuts in Windows that you can use to maximize your efficiency. There are over a hundred shortcuts and most of them will never be used, however I have decided to share some of my most commonly used shortcuts which I use to maximize my efficiency. 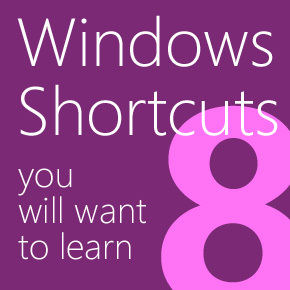 Today we will talk about twelve keyboard shortcuts combinations that will make working on Windows a lot faster and easier for you. This keyboard combination is universal in Windows and will work in any program you have installed. It is the shortcut command for Copy. It allows you to copy text from one window and paste it into another or if you are using Windows explorer, it will allow you to copy files. This is the keyboard shortcut for Cut which will copy your text or files on your computer then removing them from the document or folder you are cutting them from and then allowing you to past them somewhere else. This is another universal shortcut which is the command for Paste. It allows you to take the information you have copied or cut and paste them into a new place. If you make a mistake when typing in a word document or if you moved a file from one folder to another by accident (also pressing delete to recycle bin by accident) then you can press these keys in order to Undo your mistakes. This shortcut will allow you to Select All of the text in a document or all of the files in a folder you are looking at. In a web browser, it will select all the images and text on the page as well as the links. This is a dangerous keyboard shortcut combination because it will delete files from your hard drive rather than sending them first to the Recycle Bin. It is important to be very careful when using this shortcut otherwise you can lose important files because CTRL Z or Undo Delete do not work. When you are using Windows Explorer and are browsing through your files, every once in a while yuou will come across files you need to know more about. By using this keyboard combination, you will be given a popup window with the properties of the file you have highlighted. This keyboard shortcut combination is very useful when you have several windows open, especially when you have multiple windows of the same program open because what it does is that is allows you to switch from one open window to another. Using the Windows key and Tab will allow you to do the same but in a fancier way, where you see all open windows and scroll through them with a full preview image. This keyboard shortcut is another one I use quite often because it allows you to minimize all windows you have open at the same time and view the desktop. If you press this shortcut combination for a second time, it will bring up all the windows again in the same way they were displayed before. This keyboard combination will start the windows search function and allow you to find any file on your computer by simply typing in the name. This shortcut combination will bring up the Run dialog box where you can type in the name of the program or system service you would like to use and run it immediately as an administrator. This may not be used often unless you are an avid computer user. This Key will provide you with the Refresh function in your web browser without using the mouse.